The Sinus Oscillator generates sinusoidal signals on a configurable number of channels, and allows for configuring the sampling frequency and epoch size settings. Number of channels for which to generated sinusoidal signals. Sampling frequency of generated signals. Let's create a simple signal processing scenario using the Signal Generator box and a display plugin to watch the generated signals. First, we add a Signal Generator box by drag and dropping it from the Samples category. A double click on it will display its configurable settings. Let's generate signals for 4 channels at a rate of 512 samples per second (sampling frequency) and send them down the processing line in blocks of 32 samples (epoch sample count). This means there will be 512/32 = 16 data blocks emitted by this box every second. Now we want to visualise the generated signals. Let's add a Signal Display box. We can set its Time Scale(i.e. the time span that will be displayed) by double clicking on it. Finally, we forward signals from the Signal Oscillator to the Signal Display box by linking the output of the former to the first input of the latter. The scenario may be launched by clicking the 'Play' button in the Player toolbar. 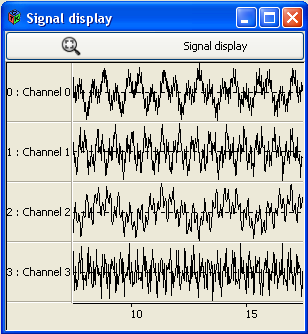 Random combinations of sinusoidal signals should be displayed in a Signal Display window, along with default channel names. Press the Player 'Stop' button to go back to scenario edition mode. A simple sinus oscillator scenario.